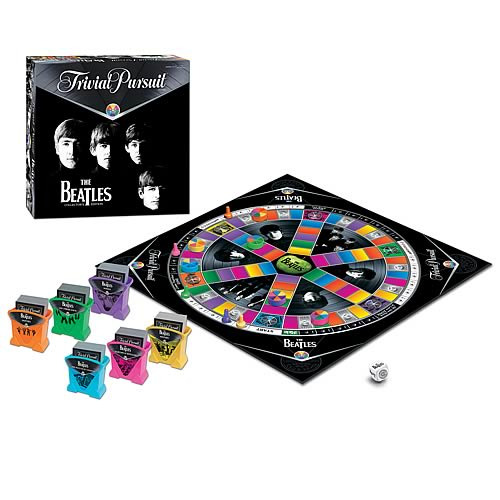 Collector's edition Trivial Pursuit game based on The Fab Four. First-ever completely authorized Beatles trivia board game. Three difficulty levels, six trivia categories, and over 2,500 questions. Do you know everything there is to know about The Beatles? It's time to find out with the first-ever completely authorized Beatles trivia board game! Included are card holders featuring famous photos of The Fab Four, three question difficulty levels, custom rock 'n' roll Beatles die, and six trivia categories: History, Songs, Albums and Singles, Movies, Beatles in America, and On Their Own. With over 2,500 questions covering two decades of everything Beatles, this game is mandatory for any true fan! USAopoly items are restricted to sales in the United States and are not available for export.